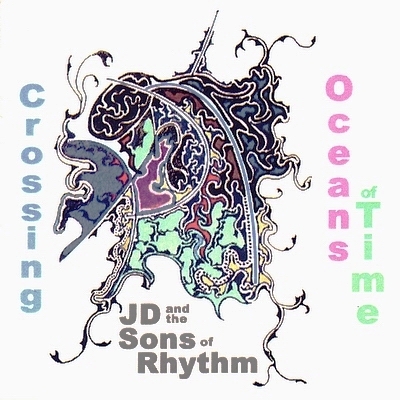 Crossing Oceans of Time begins with a classic live J.D. and the Sons jam, with the core members gelling around the 6/8 groove set up by J.D. Hopkins on the V-Drums. Rickie Hopkins starts moving things along as players fall into 6/8 Lullaby. Mike Ohm kicks off the first solo, with Tony Stefanelli on bass, Sheldon Peterson on the other guitar, and Frank Singer on a mix of guitar and keyboard (guitar-synth). Chad Garrison joins in for some trumpet fills as Frank moves into the solo spot, transforming into a lead guitar sound as the jam progresses. Singer ends on a harmonic riff which moves into the groove, leaving space for Garrison's laid back playing on the fade. A quick cut begins track two, called Eric Dolphy, which features Phil Papotnik on soprano sax (and some unlisted clarinet) and Frank on guitar. J.D. and sons Rickie and Jayson keep a tribal feel going as Frank and Phil keep the musical discussion going. Jayson has some great sound effects on this cut, sweeping in and out from the left and right stereo fields in the mix. As the music concludes, musicians who just had a great time are heard on the fade. Heavy Metal fades in during a Singer guitar lead in a jam with Ohm and Peterson on guitars, J.D. and Jayson on electronic drums, Rickie on traps, and Kenny Cornelius on bass. Ohm takes the next solo as the metal gets funkier, followed by Peterson. Kenny and Rickie build into a funky texture underneath until the guitarists begin to dialog with the rhythm. Modern swing erupts from the texture and then fractures during a clean lead from Singer that moves into kicks with Rickie and then a quick fade into Randy's Dream. It's unclear as to why Randy was dreaming this way, but it has a strange, far away quality as Tony joins Chad, Mike, Sheldon, J.D., Jayson, Rickie and Frank on keyboards for a mellow groove. Peterson leads the song in, trading with Garrison, then Ohm. Garrison returns as the harmony evolves towards the end fade and into Blaetz Runner. Bassist David Blaetz joins a funky jam with guitarist Joe Frisina playing first solo, Sheldon and Mike on guitars and Frank on piano. J.D. and Sons Jayson and Rickie keep the funk moving as Frank takes second solo. After an interlude of groove, Frisina plays the fade. Straight Ahead is, well, straight ahead, with Kenny walking along side J.D. on the traps, Jayson on electronic drums, Sheldon playing a funky lead, Mike playing the next one, and Frank on piano up next. Some two-fisted lines lead into a post-Monk crunch as Kenny heats things up for a bit. A more modern approach to jazz leads into the fade. A quick dip opens up into J.D. on the V-Drums grooving as Joe, Mike and Sheldon handle the guitars, Frank chords the organ, Jayson is on electronic drums, and Rickie and David keep the funk intact. This is a classic Midtown Recording jam, located at the title, 25th and Peach. After much exposition and development, the first side ends in a cadential fade. Phil ushers in the second side as Phil's Funk begins with an Avant-Garde interchange with Frank on piano and J.D., Rickie and Jayson on drums and electronic percussion. J.D. sets up the funk after a climactic exchange, and Singer moves over to guitar for a long sax jam with funk rhythm. Originally intended to be an overdub session, this was left intact. The interaction between the players keeps this piece going until it ends with a stock jazz ending and a laugh from J.D.. An urban Flight 54 in 5/4 time brings back Chad, Tony, Mike and Sheldon, with Frank on guitar-synth and Jayson, Rickie and J.D. laying down the rhythm. Garrison steps up as the groove evolves, then fades into Russian Lullaby. Kenny and Rickie keep things funky as Frank plays violin(s) (guitar-synth) and Mike and Sheldon form stereo guitar. Ohm leads the way for a while, then Singer follows with a violin solo that soon doubles on lead-guitar. Ohm flows out of the ending power-chord of Singer's foray, following with his own. The music drops dynamically into the original feel as Frank switches to electric piano (guitar-synth) and the music stretches. The band plays a groove-texture until the end and fade. What's Up falls right in, with Rickie laying down some swing, Chad back on trumpet, Frank on keyboards, Mike on funky rhythm and Tony on bass. Frank and Rickie jam for a while, then Mike joins in, moving to a lead sound. Sheldon enters as the groove thickens and swings over a keyboard bass-line. The fade cuts into Headhunter, an overdub session with Phil on soprano, Frank on bass, clarinet and trombone (synth-guitar), Jayson on electronic drums, Rickie on V-Drums and J.D. laying down the backbeat on the traps. This funky role-switching piece fades into the urban, Monk-esque Struttin' Again, with Kenny back on the bass in a laid-back groove. Singer leads first with soprano-sax (guitar-synth), supported by the dual guitars of Ohm and Peterson and all three Hopkins back in their usual seats. Mike plays through for a bit until a fade on soprano brings in the final track, Post Modern World. Guitarist Joe Frisina joins the group again with David on bass, the full Hopkins rhythm section, Mike and Sheldon on guitars and Frank on keyboards. Mike cuts loose for an extended guitar lesson in this industrial funk jam, with Frank following suit on the sound of a Fender Rhodes. A cascade into the low register launches Joe into growling harmonics as the song and album recede.